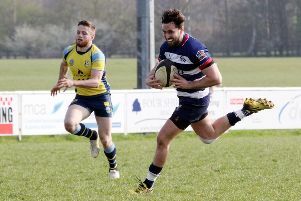 Player-coach Matt Goode says he wants to take the pressure off the play-off race for the final two games of the Wadworth 6X South West One East campaign. Banbury Bulls remain third but four points off that play-off spot which Old Centralians occupy and it looks increasing unlikely that Goode’s boys will be able to pip them. Bulls travel to Wimborne on Saturday before rounding off against Witney while Centralians travel to Royal Wootton Bassett and then host Salisbury. It will need Bulls to take maximum points and Centralians to slip up for Banbury to leapfrog them. Goode is already looking ahead to next season and improving the squad at the DCS Stadium.